I’ve been experimenting a lot in making a good pork bun and I think this time I got what I really need the same quality you get from Chinese dim sum shops. While I had posted a good bun recipe before that was not as par as what you can get in Chinese restaurants, but from now on I will have to use this recipe. One of the major changes is the use of flour, I can’t get the same texture by using all-purpose flour so I asked Asian shops what flour restaurants use for the steamed pork buns and they did gave me an answer by pointing the right product to use which is the dumpling flour, I never knew this existed until then. There are several products from just the flour alone to a complete flour mix where you have the yeast packet included if you will use this disregard the bun recipe below and follow the packet instructions. 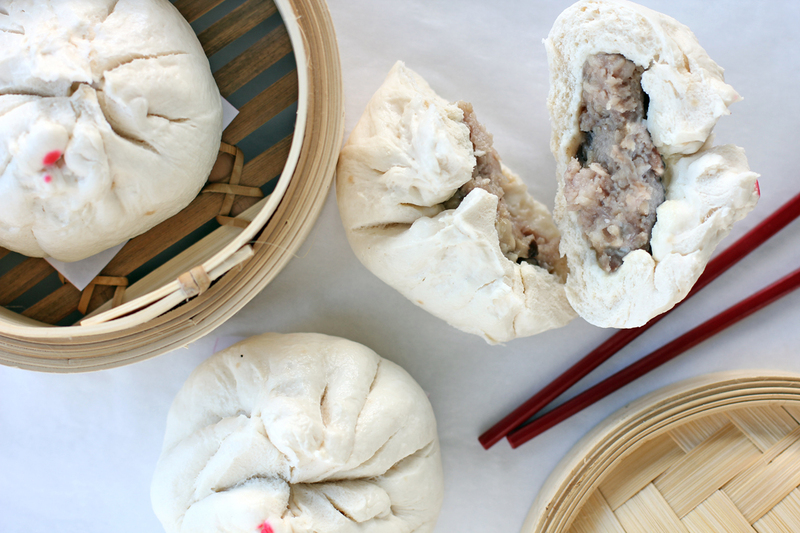 For today’s post we will make some Siopao Bola Bola, a steamed bun version in the Philippines where it is filled with seasoned minced pork. The name “Bola” means balls which describes the ball shaped filling inside the steamed buns. For those who haven’t tried this yet the best description that I can say is that it is like a cross between a Siomai and a pork steamed bun. Mix all filling ingredients together then set aside. Mix together yeast, 2 tsp sugar, and ¼ cup lukewarm water. Set aside in a warm location for 30 minutes. Mix remaining ingredients except for the baking powder then knead dough until dough surface is smooth and texture is elastic; occasionally dust the board with dumpling flour. Place in a greased bowl then place in a warm location, set aside for 2 hours. After two hours the size would be doubled. Deflate dough then spread on floured board. Add the baking powder evenly then knead for 5 minutes. Divide into 10 - 12 pieces then roll them thin, place a good amount of the mixed mixture in the middle then seal them on top, place buns in a greased paper. Do with the remaining dough and filling. Set aside in a warm location for 30 minutes. Prepare your steamer by pouring water and vinegar. Vinegar will make sure your buns are white. Place buns into steamer container then steam siopao for 20-25 minutes. Don’t think I have ever made anything quite so adventurous Raymund – great job. I have a recipe from my mum which I’ve been waiting to try out! Your beautiful bola bola bao have inspired me to get to it! There’s something so comforting about the pastry and soft melting meat, ie the tender insides. Comfort food anytime of the day. I’ll have to try to search out dumpling flour. I’m looking for dumpling flour too! I’m already pinning this…but wait! What’s in a dumpling flour? I’ve never heard of this before. Next time I’m in the grocery, I will keep my eyes open for this! I’m not sure whats on it, I just asked the Asian shops here what flour they used in steamed pork buns and they gave me that flour which has Chinese writing all over the packaging, since then I used it and never went back to the normal flour. Try asking Asian shops at your place they might give you the right product. My Grandma uswed to make this all the time went back home after 6 years to visti her and she could not find her original recipe but as I remember she use regular flour. Made this several times too with my Moms recipe with regular flour and it works great. Oh, my gosh.. this looks so delicious.. I’d love to find that dumpling flour and give this a try!! OMG! I have cravings pa naman for siopao today! I love steamed buns, but have never made them. When I crave them, I usually just go out to a restaurant! But I should really try them. Terrific recipe, and thanks for the info on the flour – very helpful. I always think steamed dumplings are so cool, they intimidate me to make though. They look just like the ones in dim sum shops! Would love one right now. I’m loving all these dumplings you’ve been featuring! Thanks for the dumpling flour tip! I’ve tried making my own doughs but you’re right – they were never quite right. You can use regular all purpose flour. I have a recipe I use and it has 3/4 cup of cake flour and 1 cup all purpose flour..sift them well..it also helps the dough be a little bit more lighter in texture..
My mom used to make siopao and used regular floour but you’re absolutely right, It didn’t have the same texture as the ones we would eat at dimsum.. I’ll have to hunt for the dumpling flour and try my hand at makiing these. Thanks for the post. Thanks for the recipe.im into a little bit of cooking too.hope I can perfect it. How about the recipe of the sauce reymond, can u share it with us? Thanks again mate. For the sauce just use Hoisin. I would have to disagree that you need to use dumpling flour to get good quality siopao. My mom does this all the time and she only uses all purpose flour but I believe that she does put in more baking powder compared to the measurements you have up there. Exactly right!! I use all purpose flour White King brand and my siopao turned out perfect. what is dumpling flour? is that same as all purpose flour? Not exactly the same. Ask for it in Chinese or Asian Shops they will have them. This type of flour yields a different texture compared to using all purpose. The texture is the same with the pao’s in Chinese establishments.